People who buy luxury homes want what they want—when spending the money on a dream home, it defeats the purpose to settle and compromise. That is often why people want a say in the design and building process, opting to custom build a property that reflects the homeowners’ tastes, which in turn reflect their personality. This isn’t uncommon—some statistics show that 60% of real estate clients looking for property in the $1 million and over range end up custom building their own homes. So once you’ve found the ideal location, research builders and floor plans and styles. What will you want to live with for the long run versus following the trend of the moment. Also, just because there is a bigger budget doesn’t mean that a budget shouldn’t be made or followed, accounting for each detail. Modern luxury homes, however, are not just palaces evoking Versailles or the Getty Museum. Most homeowners want a home that is functional and inviting, not merely a museum piece, especially since many luxury homeowners now have families with younger children. One of the purposes of a luxury home is to entertain. While some debate whether an open floor plan is in or out this year, most luxury homeowners look to host parties and events and need the space to do so. Look for floor plans that provide spacious rooms with easy access between the main areas designated for entertaining. While not everyone will opt for a show-stopping foyer that will make guests want to high-kick down the stairs like A Chorus Line, a spacious and inviting entryway is a priority for bringing in guests and managing traffic flow. Additionally, almost all luxury homeowners will want a formal dining room (an essential for resale), but it is up to the individual homeowners to decide if the majority of the entertaining will take place in a showpiece kitchen with an extended seating area away from the main food preparation area. Smart homes can be luxury homes, too. Having a smart home was a novelty for tech lovers only a few years ago, but now, must luxury homes that do not have smart home technology will be seen as deficient. A single device, either a remote within the home or a personal device or smart phone, can control all the technology of the home. Pushing one button through the wireless home automation can control lighting and climate, as well as security features. Feel secure in your investment. Smart home technology extends to the security system. While many luxury homes will be in gated communities, not all are. And not all gated communities are as protected as the vault in the Bellagio casino. 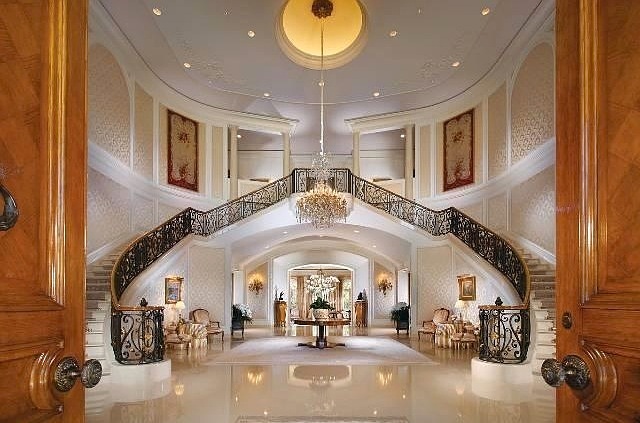 Luxury homes should provide security along with grandeur. Smart home technology offers many new systems that can monitor the entire property—even from a smart phone or other personal device, while you’re at work or away on vacation. Another element of security is privacy, which might include a high wall or strategic placement on the lot, away from the street. If the neighboring houses are near, architects can angle the windows away from the neighboring house so that no one can get a direct look inside. At least not without a drone. A luxury home means plenty of extras. The added details of the home is what provide the luxury—a large home alone is nothing more than a less-crowded Costco. The most obvious of the luxury home features is the dressing room-closet, with enough storage space to play Let’s Pretend I’m a Celebrityor house the shoe collection of an NBA player. If you are in a single-dwelling home and not a luxury high rise, you want to pay special attention to the grounds. This is especially important in San Diego and all of Southern California, where the weather keeps us outside year-round. It isn’t enough to have a pool—a luxury home should have an infinity pool with a fountain and grotto, complete with swim up bar. There should be an outdoor kitchen and living room. With all the entertaining (and time spent outside), do not neglect the outdoor restrooms, either in a pool house or cabana. This encourages wet guests to remain out of the home until they’re dry—and it helps to keep the pool at pristine pH levels. Luxury homes of the modern era are not the stuffy caricatures fromLifestyles of the Rich and Famous; luxury means getting exactly the home of your dreams, an investment you can love and that reflects who you are. When planning your dream luxury home, contact us for expertise on planning and building at www.murfeyconstruction.com. Kelsey is the Managing Editor here at The Lux Authority. Given this, she spends much of her time scoping out the latest in luxury fashion, travel, cars, technology, and people. When she isn't working, Kelsey is an avid academic, artist, stargazer, blogger, and yoga enthusiast.